Roscoe Jarboe, New Plymouth, Idaho rides 67 B Bumblebee for 90.5 points in the Shoot Out round to win the Eldorado Resort Casino THBR presented by Landers Chrysler Jeep Dodge Ram at the CenturyLink Center in Bossier City, Louisiana. BOSSIER – Delivering three picture perfect bull rides, Idaho cowboy Roscoe Jarboe stole the show with a flawless performance that included a 90.5 point ride and walked away with the bulk of the $30,000 prize money for the win at the Eldorado Resort Casino Shreveport Tuff Hedeman Bull Riding Championship presented by Landers Chrysler Dodge Jeep Ram at the CenturyLink Center on Saturday night. “I had three good bulls tonight and being my first tour event I had no idea what they were, but I like to ride them jump for jump and keep it simple, and it worked out for me tonight," continued Jarboe. It was 22 year old Jarboe’s national debut on the Tuff Hedeman Bull Riding Tour, and he quickly declared he would be back. "It was my first ever event like this, bulls are great, and the money is great, and it’s a riding contest from what I heard, and I decided to try it out, and I'll be back and in El Paso in two weeks,” said Jarboe who took home $10,125.00 for his bull riding efforts. Jarboe, a three-time NFR and the 2014 Oregon High School bull riding champion, has earned over half a million dollars riding bulls since turning pro in 2015, finishing in the top ten of the PRCA for the past three years. Despite a 2018 early back injury setback, Jarboe finished 2018 strong, placing sixth in the PRCA Bull Riding World Standings. He placed in four rounds at the NFR, fourth in the average and earned $213,801. Jarboe has finished in the top ten all three years he qualified for the NFR. The 5’11 bull rider is a past Oregon high school bull riding champion who started rodeoing at age four and was inspired by the career of two-time PRCA World Champion and bull riding great, Terry Don West. Taking advantage of the high energy in the CenturyLink Center, 11 NFR qualifiers and a pair of World Champions took to the shoots and produced 14 qualified rides in round one. Tim Bingham was the first gunner and set the pace with 90 points on 12B Hellfire (Whisnant/Shaw Cattle Co). Playing come and get me, the field of 28 elite bull riders took shot after shot at the Utah competitor. Hobbs winner JT Moore, US Army Veteran Juan Alonzo, and Lane Nobles all answered the challenge tying up the roundup with three more 90 point scores. Lane Nobles had the judges highest marked bull of the round, Mike Rawson’s 2801 Speckled Chicken, and that 90 point ride would put both him and Rawson in the driver’s seat for the rest of the competition. Benton would ride a bucker as he fought past 5060 He Reigns (4G/McKenzie/Novak) for 89.5 points. Behind Benton would be two 88.5 scores from Jeff Askey and Roscoe Jarboe who began his night on 55 Money Maker (Danny Mason). Brady Portenier, also debuting on the TH tour, and Boudreaux Campbell were 87.5 with Cody Rostockyj in at 87. Parker McCown, Aaron Pass, and Riker Carter were all 86.5 and took the last three spots to advance. The bulls slowed the action down in the semifinal 13 man round allowing only four qualified rides. McCown would be the first to ride two with an 88 on 490 Westbound (Rawson) and took the lead with 174.5 on two. Riker Carter answered with 87.5 on 291 Rocky Mountain High (Whisnant/Shaw), 171 on two. The bulls would put down four NFR qualifiers and THBRT rookie Brady Portenier before Jarboe would pick the crowd back up. Jarboe’s second bull would be away from his hand, but it was 277 Dirty Little Secret. "The second bull I didn't know him or the history, but I can see why he’s the favorite, and he was awesome, Jeff Harris told me he was no day off, but I better come to ride,” laughed Jarboe. Juan Alonzo steadily moved on with 86.5 on C-16 (Richardson) and 176.5 on two. Not ever letting anyone see him sweat, 27-year-old and 3-time NFR qualifier Tim Bingham snatched the lead riding an unknown bull, 3015 YoYo (Rawson), away from his hand for 89 points and was now the one to beat with 179.5 on two. Round one winner Lane Nobles would buck off Baker and Hurst's Road Dawg, and the four-man would be set. Parker McCown would relinquish his four-man spot to Riker Carter due to an injury sustained in round two when the bull stepped on his arm. Leading the pack with 179.5 on two, Tim Bingham earned the right to select first and chose Legacy (Whisnant/Shaw). Jarboe, new to the system had this to say about the four man. "In that minute we had to decide, I had few guys tell me 267 Bumblebee was going to go either way, and that's the way I like ‘em, so I took him," said Jarboe had second choice after Bingham. Alonzo would take a rematch on cowboy favorite and NFR bucker Yellowhair (Hurst), and that would leave Riker Carter with 226Z Wired Crazy, a two-time PBR Finals bull. Carter was the first of the final four-man round and he hustled for 87 points. Juan Alonzo had a missed opportunity to win his first event title when he let Yellowhair get ahead of him 6.64 seconds. Then there were two – both seasoned riders who are accustomed to a big stage for big money. Bingham posted 89.5 on PBR Finals bull 157 Legacy, but Jarboe edged him out with 90.5 on 67B Bumblebee. "Tuff told me he would be really up and down and to go get the money and he was right, he jumped out there to the left away from my hand and won me the money," said an elated Jarboe. To win a title and become a relevant name on his first night on tour is a story within itself as Jarboe becomes an instant hit among Tuff Hedeman bull riding fans. Mike Rawson won his second consecutive 2019 Tuff Hedeman Bull Team Challenge title with three qualified rides and 286 total points. His team included a 90 point ride from the Lane Nobles match-up with 2801 Speckled Chicken, 87 points from Cody Rostockyj on 220 High Voltage, and his rookie bull 3015 YoYo and Tim Bingham were 89 points in the semifinal round. “I liked him (YoYo) a lot and thought overall the new bull was good considering the new scenery and having to get along with new bulls - he was good for a bull I have had a week,” added Rawson. Danny Mason was behind Rawson with 284.93 points. 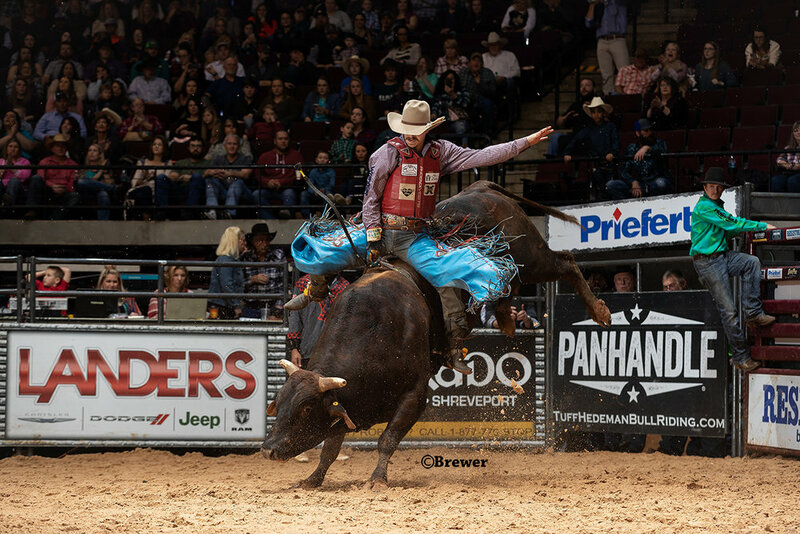 His trio’s scores were with two qualified rides and the second rankest scored bull, 503 Pan Am (91 point bull score), that bucked Trey Benton off in round two at 2.93 seconds. Third was Whisnant and Shaw with 3 rides and 282.5. Fourth was 4G/McKenzie/Novak with 280.41 and one 89.5 qualified ride from Trey Benton on 5060 He Reigns in round one.The highest bull score was 92 points earned 208 Sledgehammer on Cunningham and Scoggins team. 208 bucked off Hobbs event champion JT Moore in round two in 3.11 seconds. 1, Roscoe Jarboe, New Plymouth, Idaho, 90.5 points on 67B Bumble B (Whisnant/Shaw) $10,125. 2, Tim Bingham, Honeyville, Utah, 89.5 on Legacy (Whisnant/Shaw), $6,975. 3, Riker Carter 87 on Wired Crazy (Whisnant/Shaw), $5,380. 4, Juan Alonzo, Weslaco, TX, NS, $2,250. 1, (On three) Tim Bingham 268.5. 2, Roscoe Jarboe, 258. 3, Riker Carter 261. 4, Juan Alonzo, 176.5. 5, (on two) Parker McCown, 174.5. 1, Rawson, 286, $26,000. 2, Danny Mason/Smith, $19, 500. 3, Bob Whisnant/Shaw, 282.50, $13,000. 4, 4G/McKenzie/Novak, 280.41, $6,500.